Designed to get a high percentage of shots in the lane. When point guard crosses half court Wing (2) screens for (3). Just prior to (3) receiving the pass (5) back screens for (4). (4) and (5) should be aligned slightly toward the side where the Wing will receive the pass from the PG so the defenders are positioned behind the offensive players when the pass is receiving by the Wing. If after a few times through the offense the (5) defender begins to cheat or hedge then (5) should dive to the block rather than set the screen for (4). If (4) is open (3) passes to him. 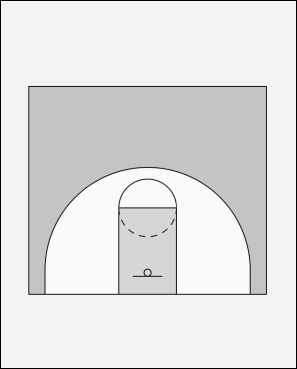 Simultaneously (5) back screens for (1). If neither cutter was open reverse the ball back to (2) who restarts the offense.